Darren Yarbrough and Dr Andy Finch are complicit in the construction of an abortion facility in Oklahoma City and are partakers in blood money. 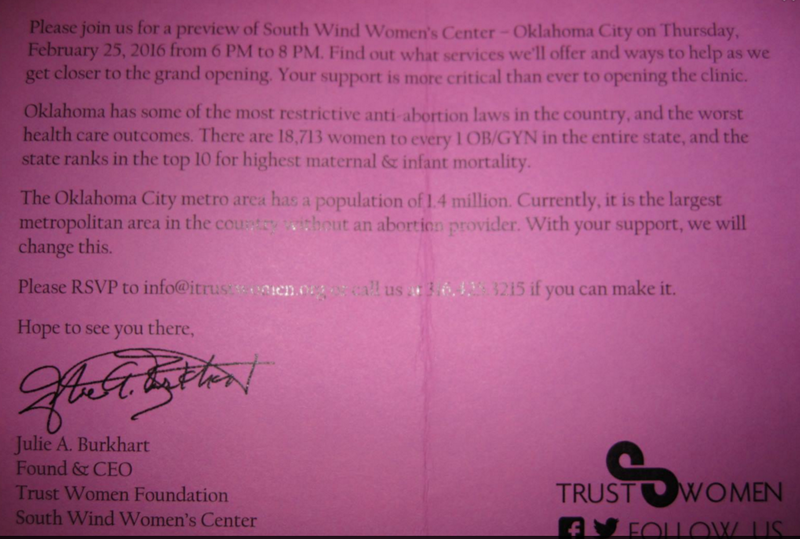 Around Feb 23, 2016, abolitionists in Norman, OK were made aware that a new abortion facility was under construction in Oklahoma City. We received a flyer in the mail from a letter with no return address and no other information. Here is a photo of the front and of the back of the flyer. 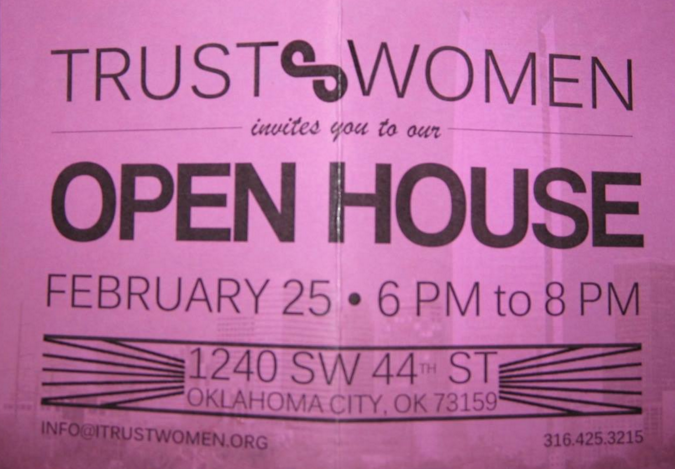 Note the address – 1240 SW 44th Street, Oklahoma City, OK.
As you can see, the flyer refers to the website www.itrustwomen.org. This is the abortion provider in Wichita, KS that the late George Tiller (often referred to as “Tiller the baby killer”) made famous. For a few years after Tiller met his Maker, the facility was closed, but it has been reopened and is under new management. It is, however, still committing the same old atrocities – murdering babies created in the image of God. The location in Oklahoma City will become a branch of the Wichita abortion provider. Note the phone number on the flyer (316.425.3215), which matches the phone number of the Contact page of this Wichita abortion mill. Having become aware of this, abolitionists began to pass by the facility at that address. On a certain day, March 17, 2016 to be exact, one particular abolitionist arrived there to look around. He found, among other things, a Yarbrough & Sons Heat and Air truck. He informed the Yarbrough & Sons employees of the nature of the facility in which they were installing an HVAC system, asking them to walk off the job as knowingly partaking in this business would leave blood on their hands. They declined to do the right thing. This abolitionist then phoned Y&S’s main office. Having been informed that the owners were out of the office, he wanted to leave a message but also communicate the gravity of the situation - Yarbrough & Sons were building an abortion facility! To ensure that the message was successfully received with appropriate seriousness, a Southern Baptist pastor from Anadarko stopped by Y&S’s office approximately three hours after that initial phone call to ask if they knew of the matter. Darren Yarbrough was present (not unavailable after all) and gave an unfavorable reply. He would be out too much money if he quit now, he said. And, the work was approximately 80% complete by that time. Darren Yarbrough could have sat down to discuss the matter further with Southern Baptist brethren, but instead of doing that, he then asked this pastor and his brother to leave. Later, the abolitionist who initially contacted Y&S reached Darren by phone. Darren was unwilling to stop work on the project and said that his pastor, Dr Andy Finch, endorsed his plan to finish the renovation. He invited this abolitionist to meet him face to face. One or two days later, the abolitionist called Darren again, only to find that the offer to meet was no longer open. All further inquiries, including questions of biblical ethics between brother Christians, were to be directed to his attorney. He also implied that he had been in contact with law enforcement authorities. For what? A few people asking him to cease any complicity with murder? A day or two after that, the same abolitionist spoke with Dr Andy Finch on the phone. In this conversation, Dr Finch treated the abolitionist shamefully and reaffirmed his support for completing the project. This phone call and Dr Finch’s sinful behavior toward a follower of Jesus is recorded, available to listen here, and embedded with its fuller context in this article. With the exception of the two phone conversations with Darren Yarbrough, there is a great deal of documentation and ethical commentary about this matter from other Christians, as noted and linked above. You see, we have obeyed Ephesians 5:11 – Have no part in fruitless deeds of darkness, but rather even expose them. We have exposed this collusion by two leaders of First Baptist Blanchard with child sacrifice. We implore you, dear reader, to do the right thing now. Expose all in your church who were knowing supporters of this, in accordance with Ephesians 5:11. –to the citizens of Oklahoma, for having aided and abetted in the expansion of the practice of child sacrifice, in accordance with Deuteronomy 21:1-9, Proverbs 24:10-12 and 31:8-9, and Isaiah 58. If they repent, forgive them and restore them to your fellowship, each one looking to yourself lest you also be tempted (Galatians 6:1-4). Then bear fruit in keeping with repentance. Please read the rest of this website (www.churchrepent.com) and take action in accordance with the Holocaust in the midst of which you and I live. Remove them from your midst if they will not repent, for the destruction of their flesh, so that their spirit may be saved in the day of the Lord Jesus (1 Corinthians 5:5). Commit yourselves as a church to being at war with the powers and principalities of our present age, turning your gaze, energies, and resources outward to the lost people surrounding you. Help us oppose this massive evil, for at 2453 Wilcox Drive in Norman, OK, babies are murdered four days per week. At 1240 SW 44th Street in Oklahoma City, OK, babies will be murdered starting soon. Your help is needed to bring the Gospel into conflict with this enormous atrocity. You are living in the midst of a Holocaust. Leaders of your church have blood on their hands, and some of that blood money has most probably found its way into your church’s offering plate. Judas Iscariot had the sense, at least, to throw his own blood money back. Have you not fattened your hearts in a day of slaughter (James 5:1-6)? Does not the blood of children cry out against you (Genesis 4:10)? Are you not being led by blind guides (Luke 6:39-45)? Please do not make the excuse that these men have a good reputation and history. So did the Pharisees. Ask them to make their calling and election sure (2 Peter 1:10) by choosing to repent of this, to cease doing evil and to learn to do good (Isaiah 1:2-20). Did not the Lord Jesus say that many will say to Him on the day of judgment that they had done many wonderful works in His name, and yet they never knew Him (Matthew 7:21-23)? We love you. We want you to flourish in God’s kingdom. We want the best for you. We do not want your money. We do not want to destroy anyone or their business. We want what Jesus wants – repentance, and fruit borne in keeping with repentance. Please, if we can help you understand the situation better, if we can answer any questions, we are local Christians. We will set aside time to meet with you, to talk on the phone with you, to email with you, whatever it might be. Whatever it takes. This is not a legal matter. This is about the kingdom of God. If we hated you, we would say nothing. We would remain silent. Love cannot remain silent. You are the salt of the earth; but if the salt has become tasteless, how can it be made salty again? It is no longer good for anything, except to be thrown out and trampled under foot by men. You are the light of the world. A city set on a hill cannot be hidden; nor does anyone light a lamp and put it under a basket, but on the lampstand, and it gives light to all who are in the house. Let your light shine before men in such a way that they may see your good works, and glorify your Father who is in heaven. Copyright © 2013 Abolish Human Abortion. All rights reserved.